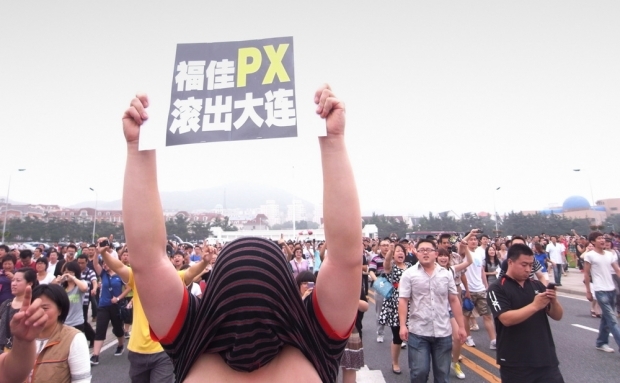 A protester holds up a sign as hundreds of people demonstrate over the Fujia chemical plant in Dalian, in Liaoning province, August 14, 2011. An influential Chinese newspaper urged citizens Monday against taking their grievances to the streets, after thousands of protesters forced the closure of a plant that they said could belch out carcinogenic chemicals. While some Chinese media have flown into high dudgeon over allegations of sun-exposed hamburger buns at McDonalds, powder-based soy milk at KFC, and pork broth made from concentrate at Ajisen, a more grassroots protest gained notice across China when public anxiety in Dalian over safety issues at a local petrochemical plant resulted in what seems to have been spontaneous demonstrations and an apparent capitulation by the new mayor of the coastal city to public demands that authorities move the plant. This week on Sinica, we’re going to talk about both what happened in Dalian this week, as well as an upsurge in truly bizarre scandals getting coverage on CCTV. Kaiser Kuo is joined in our studio by Josh Chin from the Wall Street Journal. We’re also privileged to have Christina Larson on hand. Christina is a contributing editor to Foreign Policy and often writes on Chinese environmental issues. She is also just back from Dalian and brings her personal perspective on what is happening on the ground there.